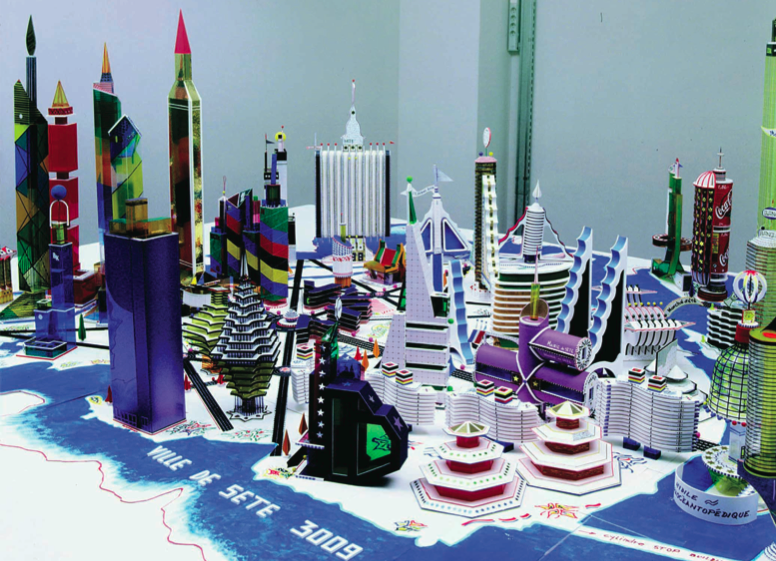 Bodys Isek Kingelez (Germany/Congo), La ville de Sete en 3009, 2000, paper, cardboard, paint, sequins, glue; covered by polyester in wooden frame, 210 x 300 x 89 cm. Collection Musee International des Arts Modestes, Sete, France. ‘Africa Remix’, the recent showcase of African art at the Hayward Gallery in London, prompted a number of mixed but largely positive critical responses. In the Observer, Emma Lindsey extolled the ‘ground-breaking and electrifying work’ (26) on show and encouraged everyone to see it. Elsewhere, and in a more mixed response in the Guardian, Jonathan Jones was impressed by the art in the show but equivocal about his own reaction to it. Towards the end of his article, Jones wrote ‘but that’s enough criticism. In the end, this is a subject I probably shouldn’t even be writing about. What do I know? Racism is limitless’ (22). The sense of bemusement in Jones’s article is worth dwelling on here, not least for the fact that its disposition reappears in more ‘critical’ reviews of ‘Africa Remix’. In Art Monthly, Sally O’Reilly’s review of the same show started with the above quote from Jones’s article and went on to engage in its own series of caveats. ‘It was not my idea of fun to review ‘‘Africa Remix’’ either,’ O’Reilly wrote, ‘and the idea would be horrifying, I imagine, to most European art critics especially those from European nations’ (27). For O’Reilly, this ostensible conundrum is made manifest in a number of ‘double binds’ including, but not limited to, the manner in which postcolonial liberalism can often translate into ‘colonialism itself when applied to interpretations of ‘‘the other’’’ (27). In the subsequent issue of Art Monthly, O’Reilly was taken to task on the letters pages for both an ‘unreflexive’ response to the show and the reiteration of a view of African art as somehow culturally (and hence critically) other (Jelinek 14). To Art Monthly’s credit – being one of the few journals in this country, alongside Third Text, to consider the question of art criticism and its purpose to be worthy of any enquiry at all – it allowed this discussion to continue into the following issue where Jones’s take on the show was criticised for being ‘intellectually cowardly’ – a response, in sum, that merely re-codified a number of obstacles to formulating an effective critical response (LaFuente 17). Downey, Anthony. “Critical Imperatives: Notes on Contemporary Art Criticism and African Cultural Production” Wasafiri 21.1, 2006: 39-48.